Here is my review of Inheritance, the fourth and final book in the Inheritance Cycle by Christopher Paolini. Since the day, I started reading Eragon *book one of the series*, nothing on the earth could subdue my interest in the Inheritance Cycle. The books were fantastic showing you a new world, new species, races, customs, life-styles, new attitudes, soldiers, royalty and a lot more. 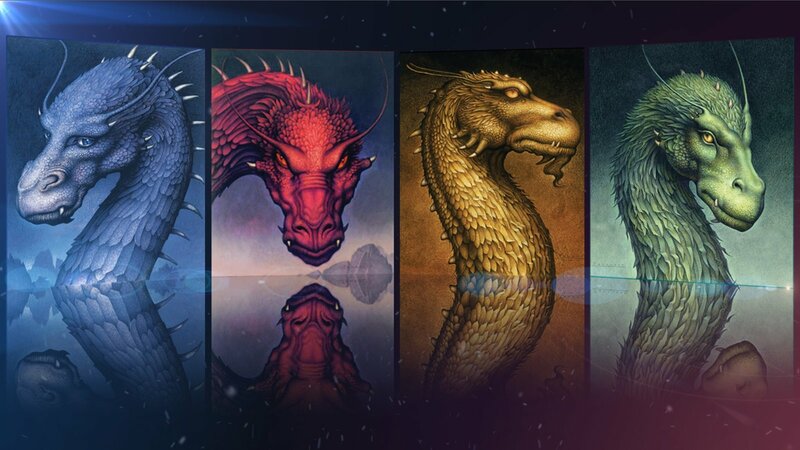 What was fascinating about the series isn't just the concept of dragons but the narration, the characters and the world of fantasy as imagined by Christopher Paolini. The fourth book, viz Inheritance, takes you into war, fighting, plots, horror, gore, death, shows mysteries, plots, traps and makes you praise Roran the StrongHammer, Nasuada leader of Varden, Arya the Sladeshayer a little more than ever. The book portrays many an aspect of war planning, life and conduct of kings, thoughts of Captains in army and burdens of soldiers in the Giant War Machine. Book simply creates awe among its readers by showing the efficiency of Dwarves with machines and skill of Elves in fighting. The book also introduces you to the Evil King Gilbatrox and his dragon Shruikan and his idea of a world in which magic is controlled. A world in which Gilbatrox with his knowledge of the true name of Ancient Language can keep every spell-caster at bay, at check and bring peace to entire world. A world in which normal people aren't at the mercy of Spell-Casters. The book ends with demise of Gilbatrox and his dragon which brings the war to an end except for a few skirmishes here and there. Murthag and his dragon Thorn change themselves and retire to solitude of loneliness. The different races *Dwarves, Elves, Urgals, Humans, Were-cats* at peace with each other while Eragon goes to east of Alagesia to build a hall and train young riders there. What is disappointing is the fact that the battle between Gilbatrox and Eragon isn't as ferocious and as heroic as I expected. 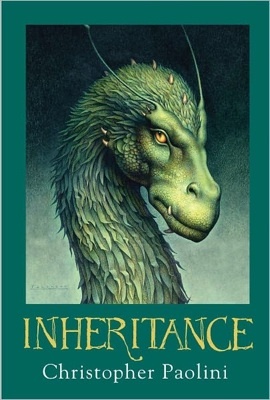 The Inheritance Cycle is and will always be my favorite because it showed me a true world of fantasy. Poor thing that the Inheritance book didn't add anything to this world of magic. In the end, the victor of the war i.e. Varden decided to create a committee which shall a tab on Spell-Casters. Verdict: Fans might get be-raged by this book, I would suggest you read the entire series anyway. 6/10 would be cool for this book. Are you done with this book or any other book in this series? What have you got to say? Loved them? Why is this book your favorite? Metal Strom, a weapon which has no moving parts, uses electric shocks to fire bullets at incredible speed of 10,000 rounds per minute, found in Matthew Reilly's Scarecrow book. These new soldiers were equipped with MetalStorm Ml00 assault rifles. A variety of rail gun, the MetalStorm range of weapons do not use conventional moving parts to fire their bullets. Rather, they employ rapid-sequential electric shocks to trigger each round, and as such, are able to fire at the unbelievable rate of 10,000 rounds per minute. It amounts to a literal storm of metal, hence the name. He fired a burst from his MetalStorm rifle into Zawahiri's chest. The terrorist was hurled backwards, his torso torn to mush, his body all but cut in half. 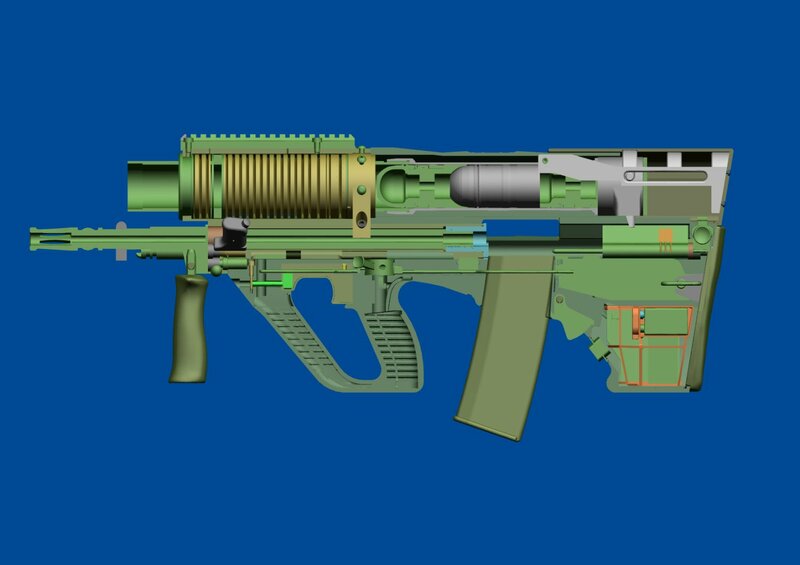 Metal Storm Limited actually manufactures Metal Strom riles which use the concept of superposed load; multiple projectiles loaded nose to tail in a single gun barrel with propellant packed between them. 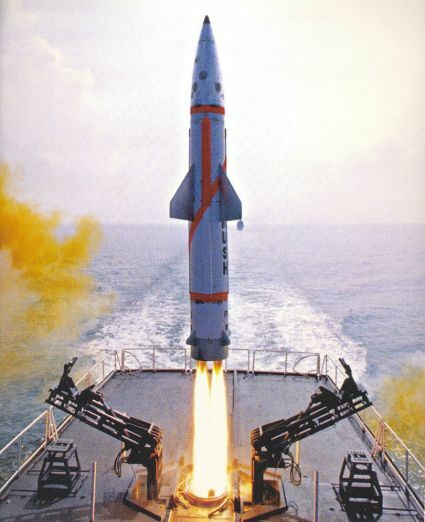 The distinguishing features of this technology are the absence of ammunition feed and casing ejection systems (the only moving parts are the projectiles), and the electronic ignition of the propellant charges. The electronic ignition allows for the firing of the stacked ammunitions at 'electronic speed' without any delays caused by mechanical ammunition feed mechanisms. 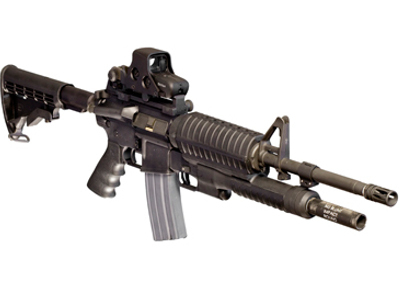 Redback, GLL4042, 3GL, MAUL, 36 Barrel prototype are some of the models in this category. 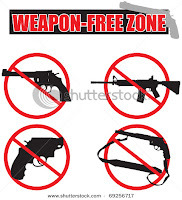 All I wanna do is check a few of them, find out their original fire-power and feel them in my hand and never never face the barrel of such a rifle .Got any weapons which are made-real from fiction world? 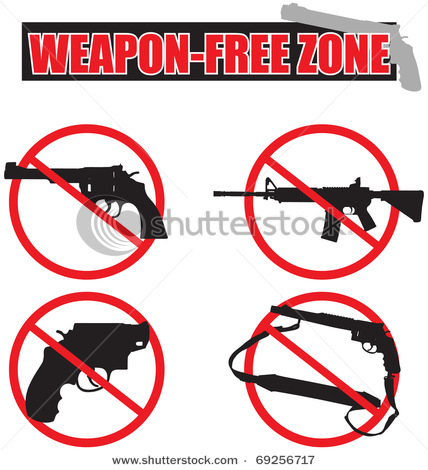 Got any weapons which are so good that they can only exist in the fiction world?? This is a Sponsored post written by me on behalf of Kia Rio for SocialSpark. All opinions are 100% mine. Kia Rio and Spotify have become partners to develop a play-list which they shall call "Best Songs with your Windows Down" playlist. Using the spotify application or the Rio Playlist tab on Rio Facebook page, users can contribute their songs and get them included in the play-list. The Rio playlist will be promoted via display media and audio spots throughout the Spotify application. Users that click on any of the Playlist promotional units will launch a branded lightbox where they can submit a song. 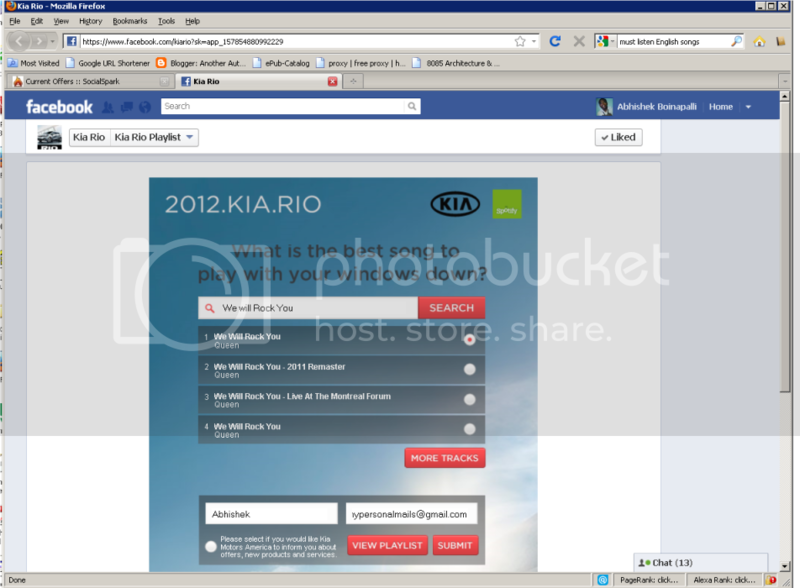 To extend reach outside of the Spotify environment, a Facebook application was created on the Rio Facebook page. Similar to the lightbox, users can submit a song and view playlist. Finally, users can subscribe to the playlist or share it with their friends. To submit a song, all you need to do is visit "Best Songs with your Windows Down" playlist on facebook. Search and spot your song based on name / artist. Once you select your song, you need to give your name and email id (not shared) and submit it. You are done. After verification, th e song will be included in the play-list. What more? You can use the View-Play-List link on the facebook page to check out the songs already included in the list. Please Note, to check the entire play-list you will have to download the Spotify application and install it once for all. A simple and easy process of-course. Just a word, kindly keep coming back to find updates about the list, the songs submitted by your friends and family and of-course to be lost in the world of dreams, humming and dancing to the BEST SONGS WITH YOUR WINDOWS DOWN PLAYLIST. To make all this more and more interesting, we have the Voice-Activated UVO Infotainment System thanks to Microsoft. I have of-course gone there right away and submitted "We Will Rock You" by Queen as my song. For the song has the craze, the lyrics that drive me crazy. The music itself is quite cool. Hey, don't forget to let me know about the songs you have submitted for this play-list. As part of the A - Z challenge, I am posting a simple post on weapons everyday *fictitious / real*. To know more about my theme and about the challenge visit this link. 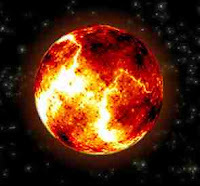 Ever wondered if Atmosphere itself can be incinerated by a weapon or two *something related to TESLA device* leaving the world life-less / crippled? Yeah, It must be possible if someone like me tried hard enough!! Ha Ha!! Here are few excerpts from Scarecrow and Army of Thieves by Matthew Reilly regarding such a weapon. When the Germans saw that they’d lost World War II, they retreated, burning farms as they went, scorching the earth. The idea was that if they were going to lose the war, then the victors would not gain anything by winning it. 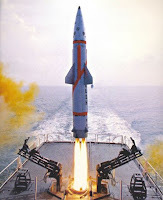 ‘They call it the “Atmospheric Weapon” and it is a two-stage device: the first stage is the combustible gas which is belched up into the atmosphere via a pair of massive vents on Dragon Island; the second stage is the explosive catalyst that ignites the gas. The subsequent blast *obtained by firing a regular nuclear missile into the gas* is hot enough to light the gas and set off the incineration—a rolling chain reaction of white-hot acid-fire follows, sweeping around the northern hemisphere, igniting the atmosphere itself. 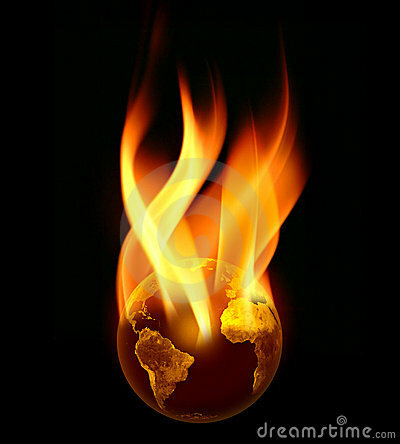 It’s like lighting gasoline with a match, only this creates a fire-storm of global proportions. ‘Only this weapon doesn’t just scorch their country, it wipes out the entire upper half of the Earth,’ the President said. Quite a sinister way to destroy the world ain't it? Go and grab a copy of this book and read it. You would be astonished with regards to how the story builds around this weapon, how Reilly can turn it upside down in no time and how he can make you believe in Super-Man!! I would seriously like to create / see someone create, most of the weapons from Matthew Reilly books sparing this Atmosphere Incinerator. Fan of Matthew Reilly? 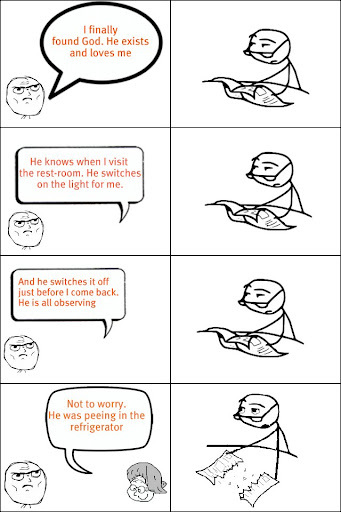 Got a point to share about him? Why don't you check more of his weapons warbler or the bull-stoppers? 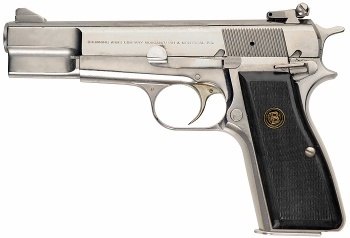 If you ever need a pistol that is compact, has at-least 10 rounds in its disconnect-able magazine, safe, robust in design, simple to assemble and disassemble and can kill a man at 50 meters, then Hi-Power is for you. So, in simple words, the range, the weight and the accuracy of the Hi-Power are its pros. To my knowledge Desert Eagle is the only weapon in this class that beats Hi-Power in popularity among geeks. Ever shot one? Ever tested one? Love the looks of the gun? 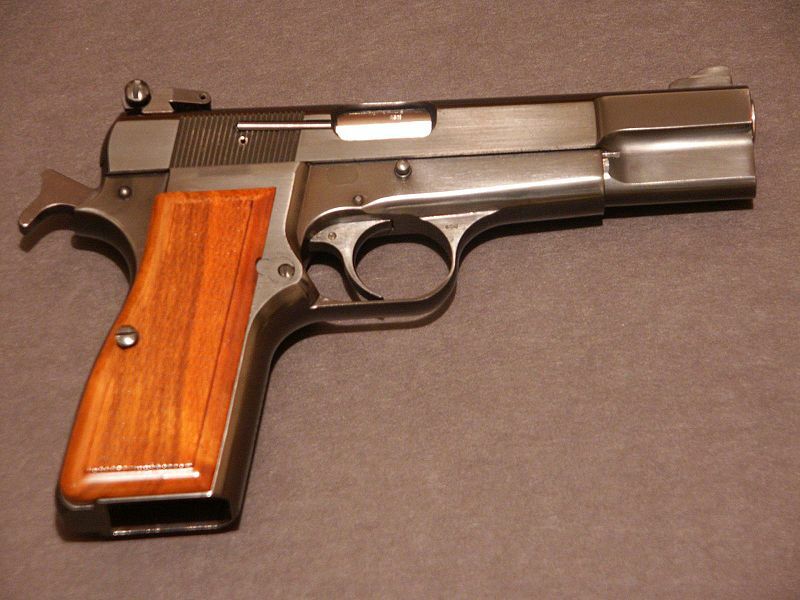 If you were to choose a gun what would its specifications be? What would it be? One more silly but humorous troll picture to share!! You can visit the other troll pics I made here and here. Got an idea which can be made into a wonderful troll pic?Do let me know for sure!! After all attempts at motivating myself, learning to be disciplined it looks like I am failing to blog regularly and missed posting for the alphabets B and D already in the A - Z blogging challenge. As part of the A - Z challenge, I am posting a simple post on weapons everyday *fictitious / real*. To know more about my theme and about the challenge visit this link. While this was happening, Knight started loading his H&K pistol with some odd-looking 9mm rounds. Each bullet had an orange band painted around it. 'People, no. Fighter planes, yes,' he said as he loaded the orange bullets into his Desert Eagle's magazine, finishing at the same time as a second Mirage swooped down over the road right in front of the WRX, its guns blazing. But now, Schofield was ready to respond. He lifted himself out the passenger window, sat on its sill, and pointed his Desert Eagle dead ahead. The Mirage's bullets tore up the road in front of the WRX just as Schofield started firing repeatedly at the hovering plane— blam!-blam!-blam!-blam'.-blam!-blam!-blam'.-blant!-blam!—hitting it in both of its air intakes at the same time as some of the fighter's tracers sizzled in through the windscreen of his WRX. Schofield's gas-expanding bullets did their job. As the first bullets hit the Mirage's intake fans, their internal gases blasted outward, tearing the fans' blades to pieces, warping them, causing them to jam and the plane to stall and also to allow the following bullets to race fully into the jet engines themselves and detonate within the plane's highly volatile fuel injection chambers. Two small bullets was all it took to destroy a $600 million warplane. Aren't they awesome? Don't you love them now? Well Well, it looks like the Great Britain Empire had these rounds in their arsenal. 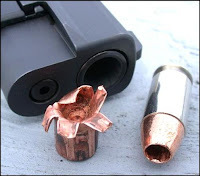 An expanding bullet is a bullet impact, increasing in diameter to limit penetration and/or produce a larger diameter wound. 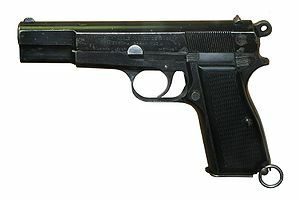 It is informally known as a designed to expand on Dum-dum or a dumdum bullet says the Wikipedia. Would you like to try them? 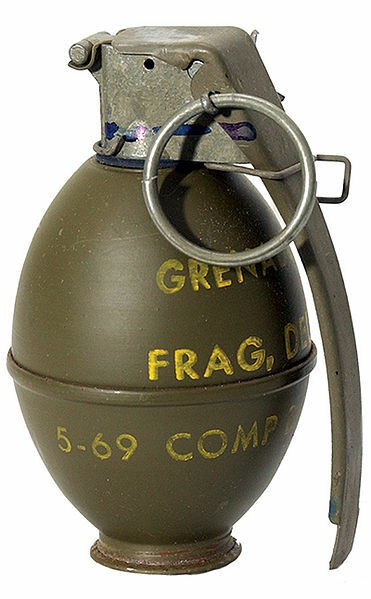 I really wanna see them expand on impact and the action on the ballisticsa of the round, the design of the round a truly feel them in my hands. I am neither cheating nor inventing a new language. As part of the A - Z challenge, I am posting a simple post on weapons everyday *fictitious / real*. To know more about my theme and about the challenge visit this link. I intend to post about Closed Atmospheric Field De-stabilizers (aka Warbler) today. Wizard popped up out of the manhole, his grenade launcher raised. He fired it three times, each shot emitting a loud puncture-like phump. The rounds that burst out of the grenade launcher looked like grenades, but they weren’t grenades—fat and round and silver, they fanned out to three corners of the giant cavern, little red pilot lights on them blinking. The Europeans heard the first shot and by the third had located Wizard. A French sniper on the cabin of the crane swung his rifle round, drew a bead on Wizard’s forehead, and fired. It peeled downwards almost as soon as it left the barrel of the Frenchman’s rifle—where it struck an unfortunate croc square in the head, killing it. The three odd-looking silver rounds that Wizard had fired were more formally known as Closed Atmospheric Field Destabilisers (Electromagnetic), but everyone just called them ‘Warblers’. One of Wizard’s rare military inventions, the Warblers created a magnetic field that disrupted the flight of high-subsonic metal objects—specifically bullets—creating a gunfire-free zone. Ain't that an awesome invention? Ever imagined something like that? You are in enemy controlled zone and yet their rifles, bullets and snipers can't get you just because you fired a Closed Atmospheric Field De-stabilizer (Warbler)? 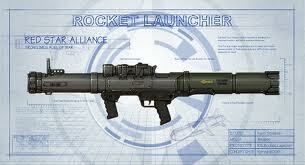 This fictitious weapon is from Seven Ancient Wonders by Matthew Reilly. Read any of his books? Know any of this cool weapons?